This project involved the fee acquisition of a 55-acre parcel which divided Clifford Park in the City of Biddeford. 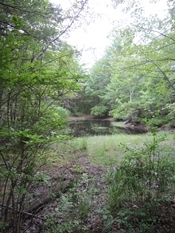 It is located within the Biddeford-Kennebunkport Vernal Pool Complex and contains a number of vernal pools and other wetlands. Acquisition of the parcel consolidated a 140-acre protected swath of city park land and prevented development that would divide the current city parcels in two, fragmenting an intact habitat block. It also allowed for active management of the trail system on the property to protect wetland and habitat values. As part of the project, trail work was done to remove debris from a stream and replace the crossing with a bridge and the placement of waterbars to control erosion on steep areas.